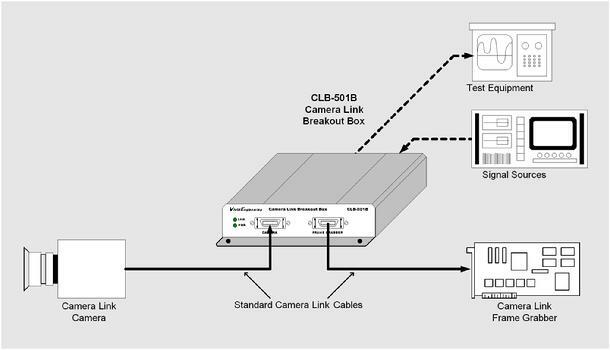 The CLB-501B Camera Link Breakout Box provides convenient access to the data transferred between camera and frame grabber over a Camera Link connection. All video, control, and communication data can be monitored and/or sourced via a standard header connector located on the rear panel. CLB-501B incorporates high-speed 85MHz interfaces and is compatible with all Camera Link “base” configuration cameras. A front-panel link status indicator identifies an active connection. The CLB-501B is housed in a sturdy, compact aluminum enclosure. A locking-plug power supply is optional. Camera Link cables are readily available with the standard (MDR) connector on one end and the mini (HDR/SDR) connector on the other. Note that the CLB-501B does not support PoCL. For example, cables used to connect the camera to the breakout AND the breakout to the frame grabber should be no longer than 5m with an 85 MHz camera.